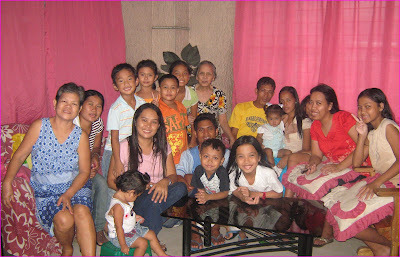 My Crossroads: :WS - Mom's 77th Birthday! :WS - Mom's 77th Birthday! Mom celebrated her 77th birthday last Saturday the 30th of this month. It's her happiest birthday to date as the gift she has received from God surpassed all material gifts. God has given her another chance to see the beautiful creations of God. She's even happier when our close relatives went all the way from Laguna to greet Mom! They brought many foods you'll think they're the host :-) Actually we didn't invite anyone but we cooked spaghetti, afritada, barbeque and lots of dessert. All of our guests brought some kind of food like maja mais, kare-kare and many more. A belated Happy Birthday to your Mom.